A weekend cake- I love it! A good cake does make the weekend even better, if you ask me. (Hopefully it will make the nor’easter we’re about to get socked with better, too!) 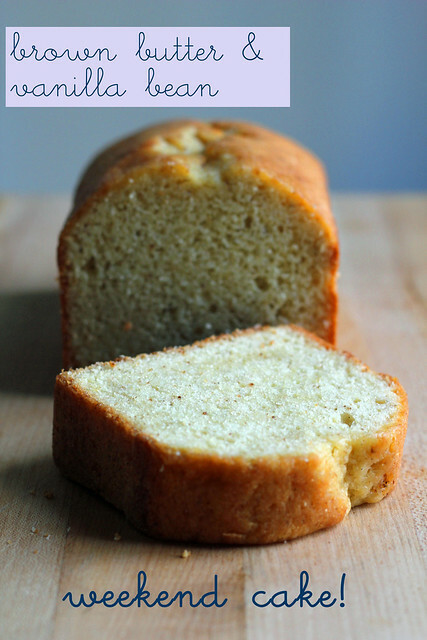 This one’s a simple loaf cake, but it’s flavored with brown butter, vanilla bean and rum. Simple but special. I have a French blue steel loaf pan, and I thought it naturally appropriate to use for a French cake. I like that the pan has perfectly straight, not flared, sides. It’s longer and slimmer than the standard 9×5, so I was sure to check it in the oven plenty early. The ingredients are lovely and fragrant, and the cake smells so good out of the oven, that it’s hard to wrap it up and let it sit overnight like Dorie suggests. It’s less buttery and heavy than a pound cake but has a similar delicious crust. This cake is good on it’s own or with a sauce. (I’m going to try it in early summer as a strawberry shortcake base.) If you can’t eat it all up over the weekend, don’t worry because it freezes nicely. Dorie also says stale slices are good toasted, although I don’t plan on testing that out this time. Looks delicious! I must give it a go. Perfectly perfect, as always…love the shape so that pan is a winner. I wish I could see what that pan looks like, I might need to get one of those!! I bought it online several years back and now don’t remember where it came from. A Google image search didn’t turn it up. It’s not as tall as a traditional Pullman pan (and doesn’t have a lid), but looks quite similar in blue steel. I went to the website and looked at the pan and they have a lot of sizes…I really like the straight sides and the height/width combinations. Thanks…I am going to order a couple of them. Wait…I really want the recipe for this one!! Love the look of your cake! this cake looks great! looks so yummy! Hi! I baked with you through TWD Baking: From My Home To Yours and would love to jump in with BCM as I just purchased the cookbook. I hoped you would be baking through it! You are posting the items here each month to complete-is that correct? So excitied! Hi Julie. That’s great–we’d love to have you bake with us! Visit the tuesdayswithdorie.com site, and there you’ll find the schedule of what we’re making each month (Feb’s recipe schedule was just posted the other day) and where to leave links to your posts. You’ll want to look for the posts with “BCM” in the title (because we’re also still baking from “Baking with Julia”), and we post on the second and fourth Tuesdays of each month. Your cake looks wonderfully delicious, and so pretty!! Happy Tuesday! I love the shape of your cake! I loved how wonderfully fragrant it was both before and while it baked. I love that you used a French pan. It does give the cake a lovely shape! I love the shape of your pan! What a lovely results!!! I love the shape and beautiful golden color of your cake. Hope you are staying safe and warm! I love your picture and love the shape of your cake! I noticed right away, before I even read it was a different pan. Your loaf shape looks great — and French steel is very apropos! Your cake looks lovely – and how wonderful to be able to bake it in a French loaf pan. Great looking cake! It looks super cute unflared! That is the cutest loaf pan. You are right that the kitchen did smell good while this cake was baking. Looks so good. That pan sounds lovely too. a weekend cake – how great I read this post on a Friday afternoon, so it´s not too late to bake one! Love the shape of your cake! I think it will make a wonderful base for strawberry shortcake. Your pan gives the loaf a beautiful shape! I think this will be perfect with strawberries and cream in the summer. Love the idea of using this as base to strawberry shortcake! I am looking forward to the recipe! Your pan sounds fantastic and perfect for this cake. I love vintage and unusual bakeware and I find that Dorie’s recipes are perfect for using them.